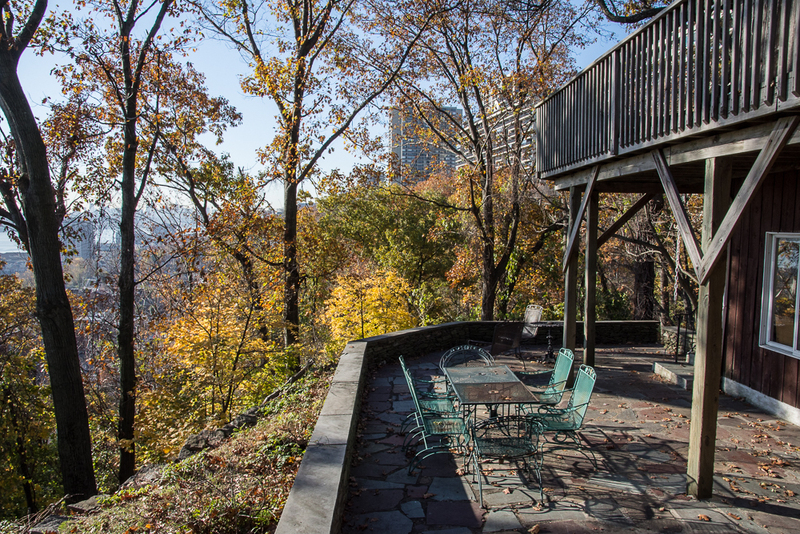 Secluded, one-of-a-kind jewel hidden in Fort Lee cliffs. 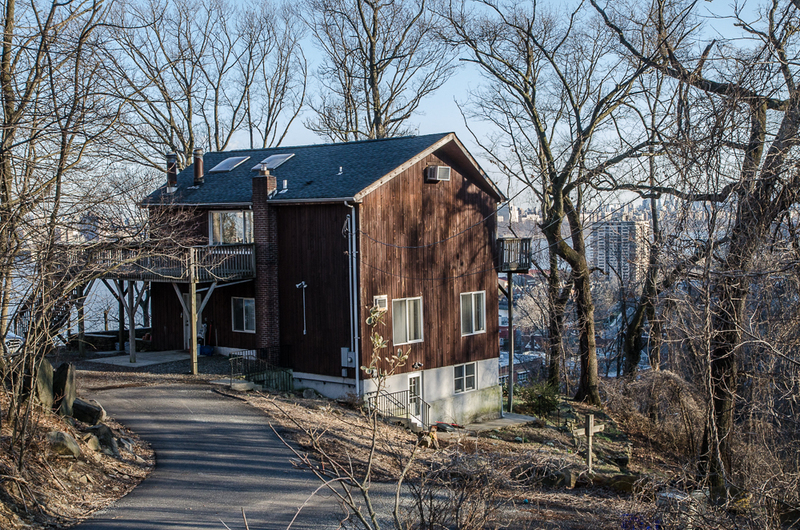 You will be amazed that a property like this still exists in Fort Lee. 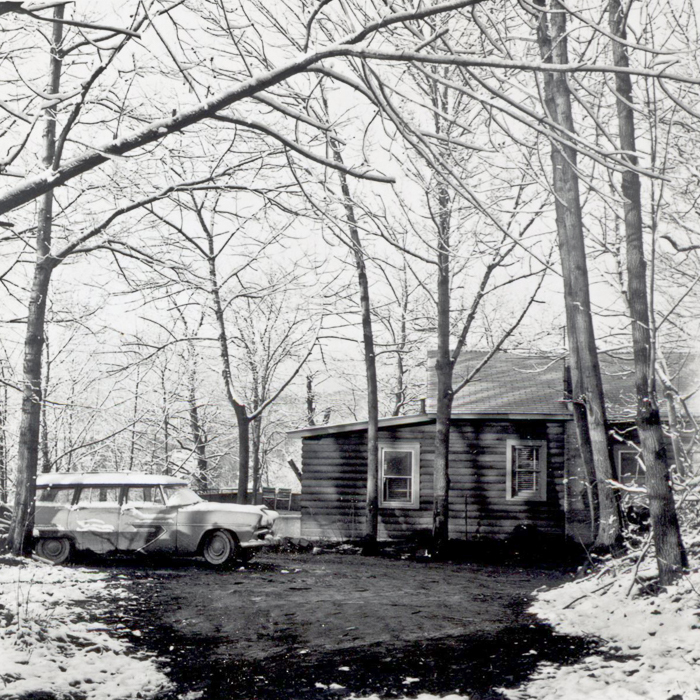 In 1957 my father, artist Irv Docktor, found an amazing property in Fort Lee–totally private in the woods, with a great view of the Hudson River. 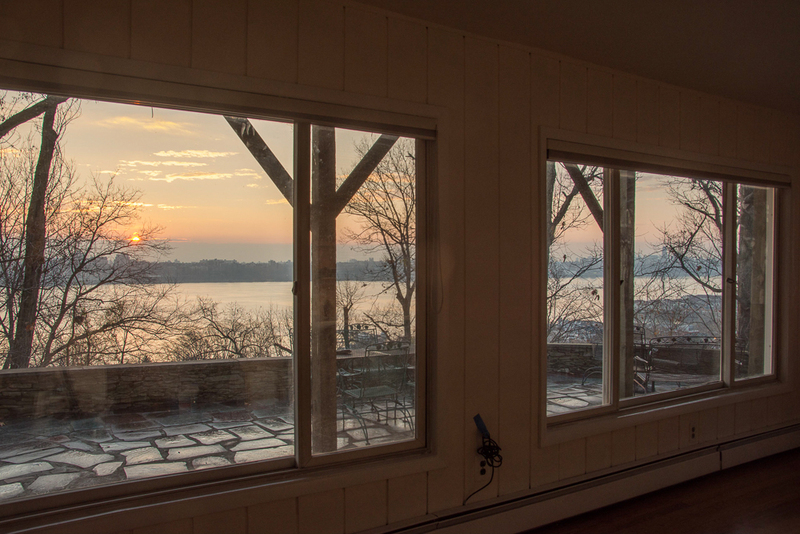 We lived in the woods, yet got to see the sun rise over the New York skyline everyday. My mom has been living there until a few weeks ago, when she moved to Five Star independent living in Teaneck, NJ. My brothers and I have been working to get the house ready to rent, and it looks amazing! Click the photos below to see the listing in NJMLS with agent Ila Kasofsky, 201-585-7659. If you want to see the photos individually, click here. 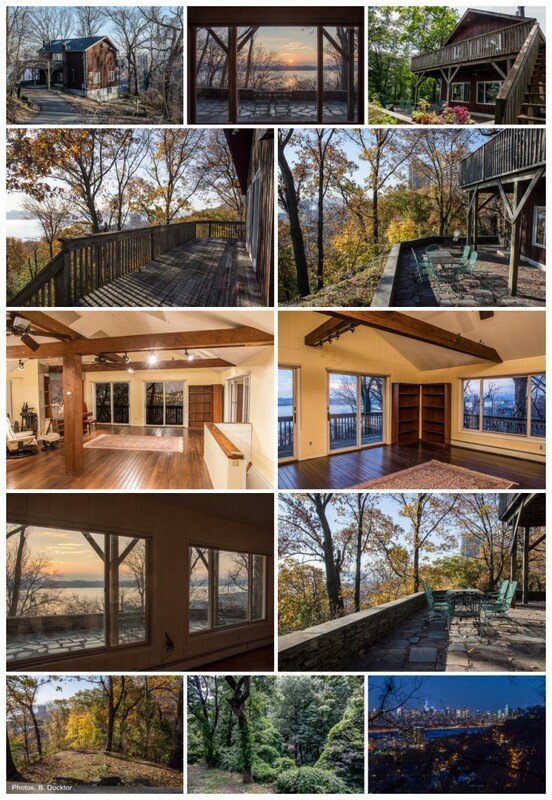 From the listing: Totally secluded private oasis, with spectacular full Hudson River view. Views from living room, master bedroom, huge bluestone patio, and wrap-around third level deck. Spectacular and expansive artist’s loft with sliding glass doors facing east to the Hudson and south to the downtown NYC view, with cathedral ceiling and skylights, hardwood floor, bathroom, darkroom or storage room, and access to the deck. Great for artist, musician, writer, photographer, or any creative person with love of natural surroundings. Endless possibilities. Entry level living room with large windows to the Hudson view and surrounding woods, two bedrooms, full bathroom and kitchenette. Lower level features kitchen/dining/entertaining area, windows with views, powder room, washer/dryer, and private entry. One mile south of the George Washington Bridge, walk to the bridge for bus to NYC, or shuttle to the Edgewater Ferry into NYC, or take the bus (a 2 block walk to the bus stop) to the Port Authority Bus Station at 42nd Street, via the Lincoln Tunnel. The town of Fort Lee has numerous Pan-Asian and classic Continental restaurants. All 3 NYC airports are accessible, LaGuardia is closest, but Newark is the easiest commute. Public library, recreation center, senior center, indoor and outdoor tennis, baseball fields and great public education within walking distance. From my brother Paul, who has worked tirelessly to save and categorize my father’s work: This home will inspire your creativity. There are no neighbors, just a haven for deer, wild turkeys, and birds of all kinds. There is even a waterfall that you can hear. The upstairs studio encompasses the entire square footage of the other floors is large enough to convert to an extra bedroom, entertainment area and creative area. Another amazing aspect to this property is that there’s room to park 4 vehicles here, and no parking fees. There are creative opportunities galore. As our father did, one could have art classes on the patio, deck, or the grounds. 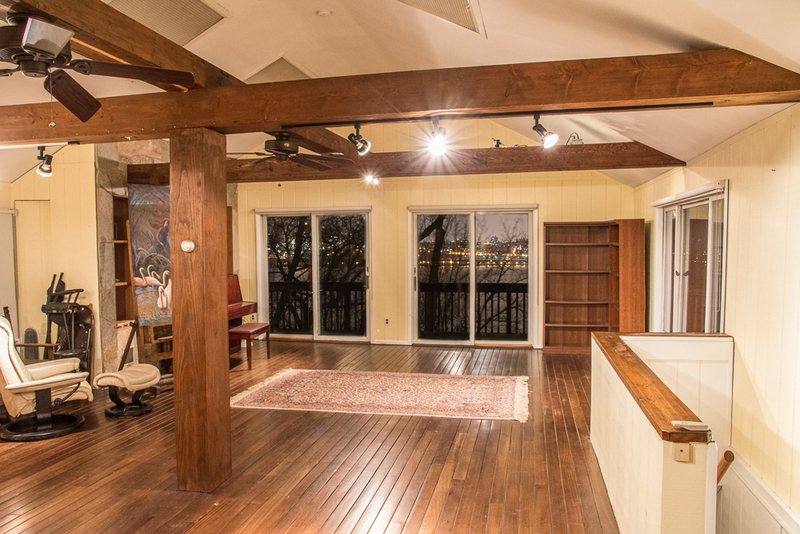 The upstairs space could be used for yoga and dance as well. Sunrises and sunsets will thrill you with a 180 degree panorama from the George Washington Bridge to the New World Trade Center. This is how it looked in the late ’50s. This is the view you get when you walk into the house. This is the top floor. My father built it to be his art studio. Spectacular views east and south, with a deck that wraps around 3 sides. Incredible privacy with a wonderful large patio and upper deck. « On-Location Family & Pet Portraits: Autumn is Prime Time!